Don’t get me wrong I still love it…but sometimes I wonder why on earth I worry about quilting it nicely if you can’t even tell once it’s washed. I even pre-washed the backing on this one. Anyways…I’m not sure if I’ll keep this one or find it a new home…it’s a nice small size, maybe 28″ x 36″…good for a car seat quilt! ohhh this is so beautiful..!!!! Very pretty and I love the quilting on it! Hmmm, so many quilts these days are thin. I suppose it's because they fit under a longarm quilting machine? Personally, I love the crinkly! Looks "loved" but not worn out! Maybe you should keep it!!! Such great colors in that quilt. And I, too, love the crinkle. It makes it look like a quilt that will be used and not just one make for hanging on a wall. I always figure the more they crinkle, the more heat they'll keep from escaping while I'm curled up under it watching TV or sleeping! very cute and crinkly! i really like the scrappy binding! I love the crinkly look!! Did you prewash the fabrics you used to piece the top, too? If not, that might be why it crinkled as much as it did. It's beautiful to me! Ha! I feel exactly opposite about the crinkling – when I'm quilting and I mess up I think, 'Well the crinkling will hide a multitude of sins…thank goodness!" I guess it depends on your skill level! This is so darling! I love how bright and cheery and crinkly it is! Well done! Love the colors and the crinkles! I' m finding that I don't want to quilt any closer than 1" because of the crinkle factor. If I want tocut down on the crinkle I also go with Dream Poly or Dream Puff. Dream Puff is like magic. It's fabulous to machine or hand quilt & then something magical happens in the dryer. It looks lovely! I like them not quite so crinkly, but uber crinkly looks so loved doesn't it! I love the crinkly, a lot.. Are you interested in selling it?? Uh, Keep it! Totally keep it. Or give it to me. Hahahhaha! Super cute!!!!! So pretty. I must say that I love the crinkly…a lot! That is what makes a quilt for me and what has always drawn me to quilts! If you give it away, they are going to love it! Bless you for your love!! I love the crinkle effect! I wonder if it is the type of quilting? My mom did a quilt for me that random loopy pattern like you used and it is really crinkly, but on others with different paterns, yet the same fabric it didn't crinkle as much. Just wondering if that could be why. Still a darling quilt! Beautiful little quilt and I am also always a little surprised when my quilts crinkle up like that. It gives it that antique look though, and just love it. 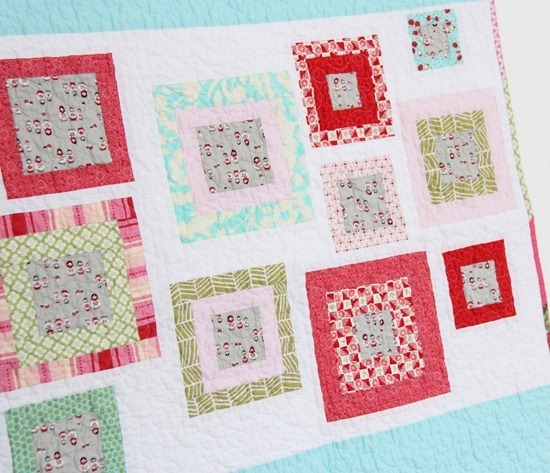 Looks beautiful with the crinkles, I'm a grid line quilter but this is tempting me to try free motion quilting ! Your quilt is adorable. And…even though its crinkly you still notice the beautiful workmanship. Love it! I love it! How much would you sell it for? Send me an email if you are looking to sell it. I've found that when I've done tight spiral quilting, that is when my quilts look the crinkliest. I love it! I find that the cotton bat will shrink. Did you use a cotton batting? I don't mind the look but I know where you are coming from. I'm not fond of the crinkle look so wash all of my fabric and the bat before assembly. Your quilt is darling though and I suspect a little person would love to have it to cuddle in the car. Im with Dianne, if I want to avoid the crinkle I pre wash everything, including the batting. Personally, I don't like 'em if they're NOT crinkly! soooo very very darling! this is gorgeous! Heavy quilting can cause shrinkage of as much as 6" from the length and width. Then depending on fabric and batting the quilt can shrink 2%-4% when you wash and dry it. Your quilts are so beautiful, I don't see any concerns. Your baby will love it as I do. Wish I could quilt like you. Love, Love, Love the Crinkly look and YES, Keep it for your baby! It is just beautiful!!! So cozy and warm looking! This is how I pray all my quilts come out once washed. It's a keeper definitely! It's beautiful and I love the crinkly! It's beautiful! I love the uber-crinkly! 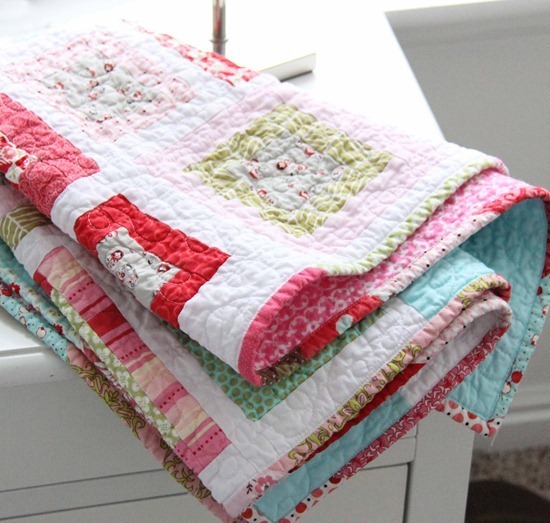 Love the crinkle, love the pattern, love the quilting! Love everything about it. Keep it! 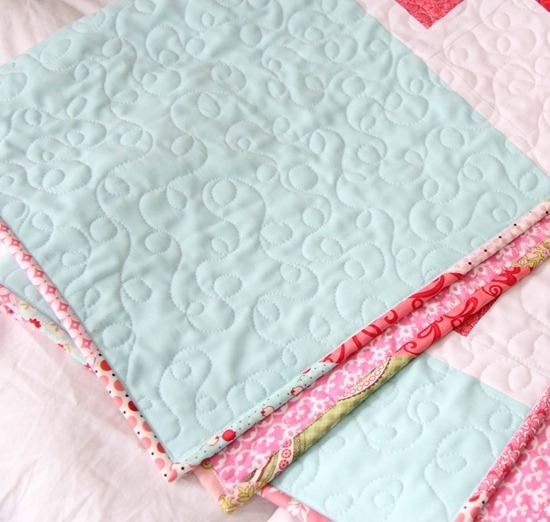 The loopy quilting is way cute! A car seat quilt! What a good idea. Whenever I see a quilt I want to make for someone (myself included) I get stuck in the rut of "Queen size? Twin size? Throw?" and decide to not make it because it seems like we're all overflowing with blankets. It's adorable! I love how it turned out! I love uber-crinkly quilts! ;) All my grandma's, g-grandma's and gg-grandma's quilts are that way! As to Ruth's comment up there regarding the thinness of today's quilts? She must be stuck in the 80's when they used 3" poly batting…ick! My family quilts from the 30's-40's all have bed sheets, wool blankets, or very thin cotton batting…some are even thinner than what I make now! The quilt and the quilting are both just lovely, but I have to say, my favorite thing to do once a quilt is finished, it to throw it in the wash and have that wonderful crinkly goodness fresh from the drier. Delightful! I love the look of it now when you washed it. It looks cozy and warm and used, the best. LOVE the crinkly…much better than pressed and pristine!! I love the crinkly look. They are so nice to snuggle under. My favorite couch quilt I quilted very close together & the more I wash & dry it the softer it gets, love it. Your quilt is so cute!